to diagnose your unhealthy sick trees in Fort Worth, TX. Sick and diseased trees in Fort Worth, TX, need to be diagnose by a trained Tree Doctor! We have the right in-house Plant Pathologist ready to help you with all your declining trees and shrubs in Fort Worth TX. Our Fort Worth tree doctor Co. brings the knowledge and tree solutions to assist you with unhealthy trees and shrubs on your property. Our Arborist Ft. Worth crew has brought real stability to helping restore the over all trees health in Tarrant County residents landscapes. Our Arbor Care professional company is based here in Fort Worth. Our Arborist crew is resourceful to helping you find the reasons for your trees decline and cause of unhealthy shrubs. We have several ways of getting you the right tree diagnosing. Good sample of soil, or live specimen sample of tree or shrub sent off to Texas A&M Labs or a local lab here in Farmers Branch for fast reassurance on our diagnosing. Most Tree Doctoring Companies would not be able to assist you with these services above. We have worked with Residential and Commercial clients. Tree doctors Fort Worth, TX is a company that seeks to find the right solutions for your tree and shrub needs. TREE DOCTORS THAT CARE ABOUT YOUR TREES. Call (817) 502-9402 Our Plant Health tree specialist Fort Worth Company treats the following tree conditions. Tree Doctor Fort Worth Co. That microinjects trees back to vigorous health. Tree Service Fort Worth offers free tree and shrub evaluations. 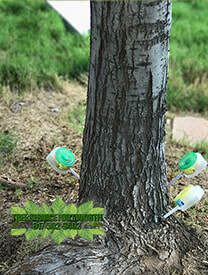 We can help you with all your tree injections needs. Our Oak Tree decline treatments will help your post Oak trees health. We also have a great plant health care system for Deep Root fertilizations injections in Fort Worth TX. If you have a Sick unhealthy trees on your landscape we can help help treat your sick diseased plantation. With access to great professional Arborist Doctors plant health care professionals. You will get the right answers to treatment and going forward with education and a great tree health plan. All tree injections come with a one year FREE re-treatment warranty. Our in-house Fort Worth arborist company has the knowledge and certification from Texas A&M extension courses to be able to diagnose and treat your unhealthy trees. All your evaluations are free of charge. All injections come with a one year warranty on all re-treatment.